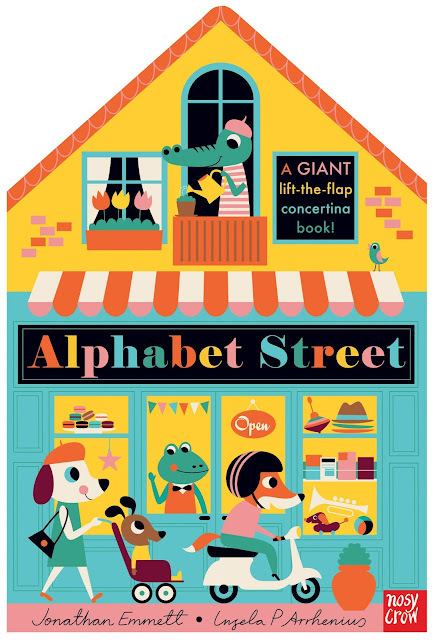 Alphabet Street is a fabulously fun and unique publication. A sturdy, house shaped lift-the-flap concertina book with rhyming text and super cute animal characters. It folds out into a large free standing street of shops with an outdoor park scene on the reverse. Each page features a shop such as ‘Elegant Fashions’ and ‘Uptown Vacuums’ with two flaps to open, in most cases, the downstairs shopfront contains a business scene and the upstairs window shows a scene which is a little more domestic and relatable to family life. Rhyming along the way, the text is fun and charming with each flap dedicated to the next letter in the alphabet and describing the scene inside. With so many amusing scenes, it’s hard to pick a favourite although the page with a ‘unicorn, using a jug‘ and a ‘vulture, who vacuums a rug‘ is a strong contender for me. The featured letter is always repeated in bold text which gives a nice prompt to children who are learning about letters and reading. Modern, digital illustrations in a retro style and colour palette set the scene and suit the charming text wonderfully. There are many details to explore on each page which will have young ones returning time and time again. This book is perfect for kids who like something tactile and unique. It can be read like any other lift-the-flap book or folded out to be used as a prompt for role and floor play. I can imagine toy cars and small animals roaming and zooming around the street and recreational scenes. Other books written by Jonathan Emmett and reviewed by Kids’ Book Review include What Friends Do Best and The Pig’s Knickers. Those illustrated by Ingela P Arrhenius include Where's Mr Lion and Pop-Up Things That Go!.